About Newport International Sports Village The Stadium, which is owned and managed by Newport City Council, has been upgraded to Nationwide Conference standard in recent years and has a crowd capacity of 4,300. The Stadium is part of the developing City of Newport International Sports Village, which includes the Wales National Velodrome. The grandstand seats 1,100 spectators and there is large covered terrace on the opposite side of the pitch and a small-uncovered terrace behind the one goal.The grandstand side also includes a licensed bar, that also serves hot food and features and large-screen projection TV, the club shop, a toilet block and a refreshments stall. With the Newport RFC building a new stadium scheduled for 2010, in line with the Ryder Cup coming to the Celtic Manor Resort, Newport Stadium is expected to be used by the rugby union teams that currently play at Rodney Parade. In 2004, Newport Stadium was upgraded to Football Conference National standard. The upgrading included a new main terrace built on the old one at the Traston Road side of the ground, commonly referred to within the club as ‘The Shed’. 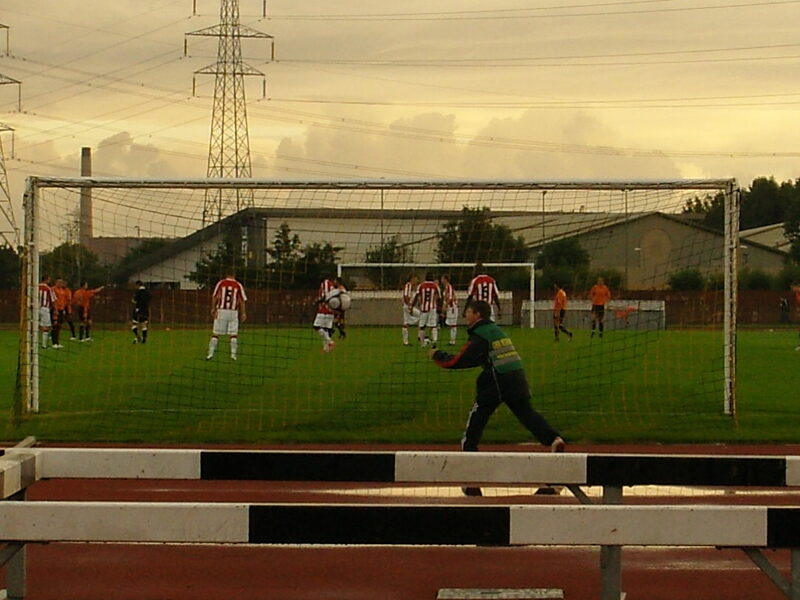 A new terrace was also built at the Spytty Road End. 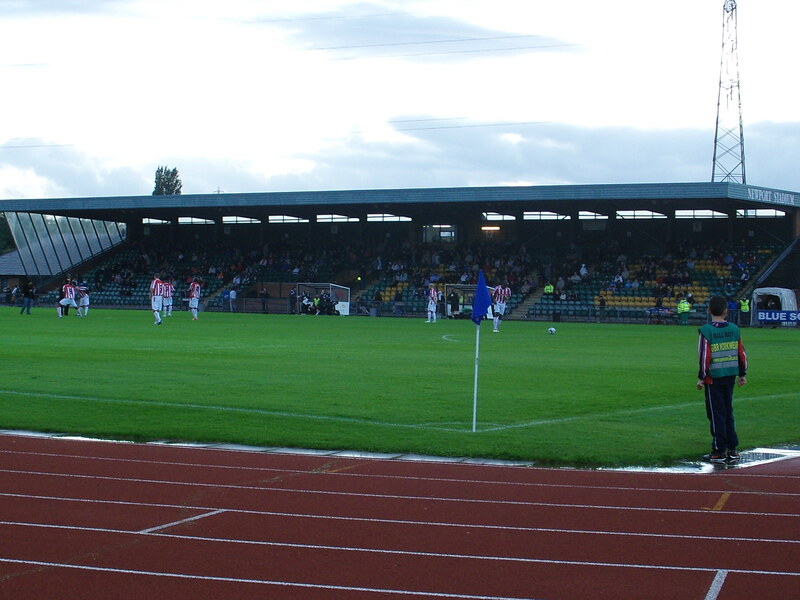 When Newport County played Swansea City in the 2006 FA Cup, a temporary stand was erected behind the goal at the Cricket Ground End to give the stadium its record capacity of 4,600. How to get to Newport International Sports Village From the Severn Bridge on the M4 take the exit signed Newport (East) – Junction 24. From the North/Midlands the A449 joins the same roundabout. Take the exit at roundabout signposted Newport International Sports Village, A48 and then then straight on at next 5 roundabouts. Take the first turning left and left again into the Stadium car park. If you are coming by rail then the nearest station is Newport which is on the Swansea / Cardiff / London Paddington line. Either take taxi from railway station or the 5 mins walk to bus station – walk straight into the city centre from railway station (via underpass), left at end of street, keep straight and pass between the Principality Building Society and Vodaphone (Skinner Street) and then turn into Upper Dock St, the bus station is off to left. Stand 23 for either No 9 or No 16 bus (approx 15 minute bus ride). How to get a ticket for Newport International Sports Village Apart from a rare FA Cup game or a big team visiting in a pre-season friendly, tickets are available on the day of the game. Ticket prices for the main (only ) stand are £11 for adults, £8 for concessions and £4 for under 16’s. 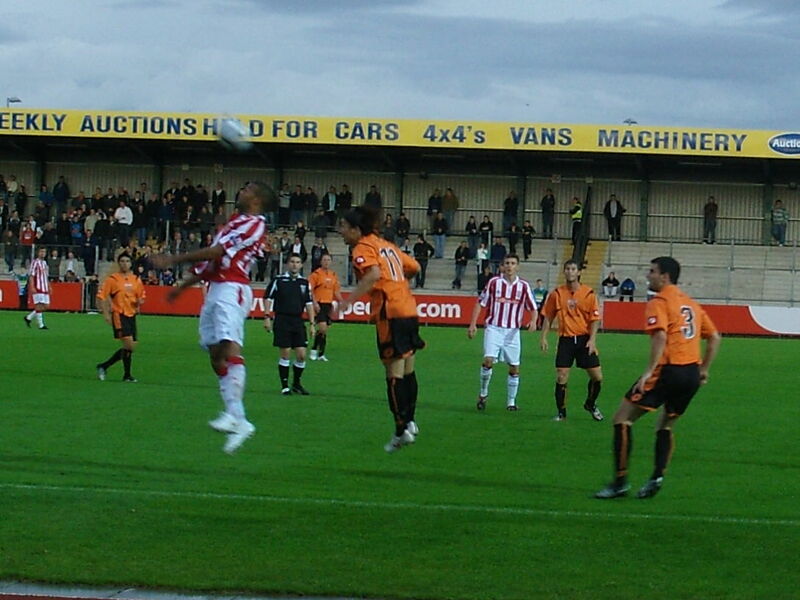 Our Last Visit – Newport County 2 Stoke City 0 – 29th July 2009 Think back to March 1981? Were you actually born? If not then let me give you a feel for what life was like. We were in the middle of a recession (so what’s new!) and chancellor Geoffrey Howe had decided to raise Income Tax. The London Marathon had just been run for the first time and Shakin’ Stevens was at number one with This Ol’House. Heady times indeed. But there was a little story playing out down the M4 that today seems as unbelievable as Joe Dolce keeping Ultravox from number one with their classic song Vienna. Approximately 200 miles from Chez Fuller in south east London sits the third largest conurbation in Wales, just a short journey over the Severn Bridge. Newport Wales, not Newport Isle of Wight, Cornwall, Gloucestershire or Essex. A town that grew up as the Steel and Coal flowed down the valley along the River Usk to the docks. A town that prided itself on its local community. And it was here, in a 18,000 capacity stadium that a small Welsh team playing in Black and Gold almost created the European Football story of the decade. On the 18th March 1981 Newport County played host to East German cup winners, and champions elect, Carls Zeiss Jena. At that time the club were still languishing in the old Football League Division 3, having at last made it out of the basement the previous season thanks to the goals of a very young John Aldridge and the veteran Tommy Tynan. The club had also captured the Welsh cup in the previous May, which at the time was a serious competition, beating Shrewsbury Town (yes at the time certain other clubs who werent exactly in Wales were allowed to compete in it!) and gave them entry into the now defunct European Cup Winners Cup. This competition was a real hit or miss affair. As with today, the domestic cup winners in most of the European leagues tend to be one of the big clubs, but of course as they tended to finish in the upper reaches of the league they either went into the European Cup or chose to play in the UEFA Cup which was deemed more of a challenge. And so some seasons the quality of teams could be good, and sometimes it could be bad. Take 1980-81 as an example. The Spanish entrants were Castilla, who had lost 6-1 in the Copa del Rey to their 1st team, otherwise known as Real Madrid as well as defending ECWC champions Valencia. From Italy there was AS Roma, and from Germany you had Fortuna Dusseldorf. Other teams of note included Benfica, Feyenoord, Celtic and Sparta Prague. Hardly a shoddy line up. As the competition was limited to just 34 teams (a preliminary round of 4 got them down to 32), you only had to win four ties to be in the semi-finals. And that is what nearly happened to this 3rd division team from Wales. They brushed aside Northern Irish champions Crusaders in round one with a 4-0 home win, following it up with a 6-0 win in Wales in round two to the Norwegians of Haugesund, seeing them into the quarter finals along with such rubbish teams as Feyenoord, Benfica, Fortuna Dusseldorf, eventual Champions Dinamo Tiblisi and London’s finest West Ham United. Whilst the draw against East German champions Carls Zeiss Jena could have been worse, their 2-2 draw in East Germany was probably the best result in the club’s history, taking two away goals home to South Wales. On that night in the old Somerton Park the team threw everything at the Germans but nothing went right for them. John Aldridge was missing through injury and the team missed him dearly, eventually losing 1-0 and lost out on a chance to meet Benfica in the semi-finals. Just seven years later the club amassed only twenty five points in the old Fourth Division and were relegated from the Football League for the first (and final) time. Worse was to follow and in February the following year the club went out of business, their points being removed from the records and the padlocks put on Somerton Park. At this point history and many of the fans today have one story, whilst others will tell you a different tale as to what happened to the club. In June 1989 a new club was formed, taking a place in the Hellenic league and playing their games in Moreton-in-Marsh some 70 miles away in England so that they would not be forced to join the Welsh leagues. The new owners dreamt of a return to the English league structure and thus had to work their way back up the English non-league Pyramid. The club, using the name Newport County AFC won the right to stay in the English leagues and return to their home town in 1995 when they also took their place in the Southern League Premier division. 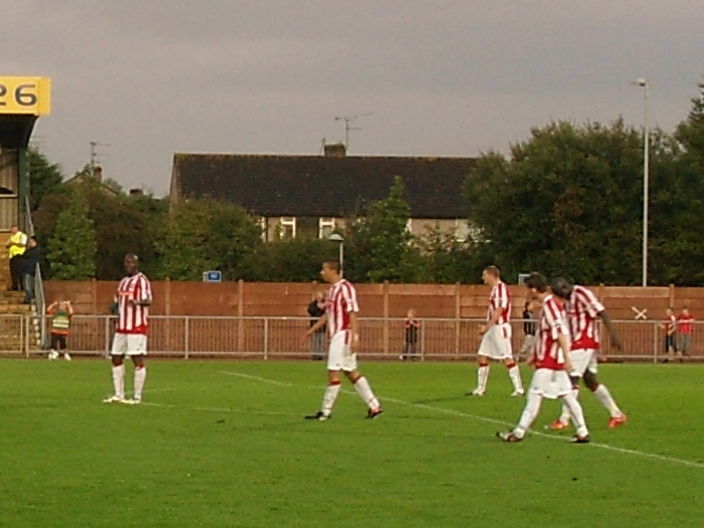 They subsequently had a top half position in 2004 when the league restructured and have since been in the Blue Square South league, the only ex-league team to be playing at this level. Whatever the ifs and buts of the origins of the club, they are still alive and most fans still appear to be united behind the club and the direction they are going in. They are no longer playing at Somerton Park, having been demolished in 1993, instead calling Newport International Sports Village as home which is a 4,300 all seater multi-purpose (i.e an athletics ground with a footie pitch in the middle!) stadium. When Swansea City played here in the FA Cup in November 2006 a record 4,600 were present. But for tonight with the visit of Premier League Stoke City the crowd was expected to be less than 500. I really do not like Stoke City. The simple reason is because of one “fan” who is also a member of the EnglandFan groups. This “loyal fan” criticises everyone else, including fellow Stoke fans for not supporting their team and for daring to moan about their negative tactics, their one dimensional manager or their poor away form. And would he be here tonight? Of course not. So sorry Stoke fans if I am negative but one bad apple and all that….In fact I counted just 7 Stoke fans in total in a pretty decent crowd of just over 600, not far off their average attendance. Pulis , who seems to have become an overnight genius with his one dimensional approach to the game (just ask Gillingham or Bristol City fans about his style of play) used to play for Newport but had deemed a game versus Forest more important and sent a second XI. It was quite amazing that so many came based on the appalling weather that the whole region suffered during the day. Still it was an easy drive from our Gower Dacha once the clouds cleared and myself, Fuller senior and junior pulled up at 7.15, after a brief detour to see the magnificent Transporter bridge and for less than £20 we took our seat in the main stand. OK – it was only a friendly, and OK Stoke didn’t have a first team out but they are “supposed” to be a Premier League team and that means having a squad not an XI. They were poor. They displayed some tendencies of a Premier League team including the abuse aimed at a linesman at the end of the first half by Andrew Davies and Louis Moult after a throw in went against Stoke which was unwarranted and quite frankly showed what is all wrong about would-be professional footballers in the world today. Dean Holdsworth had built a decent team at Newport and had managed to pick up some good young players in the summer including the skillful Takumi Ake who beat Stoke players time and time again on the wing. Some of their neat passing was very pleasant to watch and Stoke were simply not at the races, although they did have the first chance in the 20th minute when Moult headed wide from 6 yards when unmarked. Newport should have taken the lead on 25 minutes when Craig Reid was played in behind the defence by Aki and he squared for Foley but his contact was poor and the ball trickled past the post, although Reid tried to get on the end of it but was offside. A few minuted later a fantastic Danny Rose free-kick from 30 yards beat Simonsen in the Stoke goal (apparently he was once the most expensive goalkeeper in the world!) but the ball hit the inside of the post. After the break Holdsworth made a number of changes but it didn’t really affect their style of play and it was again Simonsen who was the busier keeper, called in to play to save from Rose and Aki before Newport at last took a deserved lead. After some neat build up play the ball fell to the impressive Danny Rose on the edge of the penalty area and his shot left the Stoke keeper rooted to the spot. One became two in the final minutes when Rose’s corner was headed home by Paul Cochlin to give a fair reflection on the final score. Optimism should be high in this area of South Wales for the forthcoming season. The bookies favourites seem to be big spending Dover Athletic but Newport’s style of play under Holdsworth will certainly win some admirers. It is not the best ground to watch games at with the Athletics track around the outside but what you can see is worth the journey.